While we tailor every audit to meet each client’s unique requirements and challenges, our roadmap to compliance typically follows a four-phased approach that creates the general framework of each audit. Our goal is to create an efficient, unobtrusive audit so that you can focus on your business, and we can focus on your compliance. Our team of audit professionals serves our clients by combining knowledge of industry standards and regulatory requirements with proven methodologies and tools to produce cost-effective, value-added results. And what really sets us apart from our competitors is our highly personalized, client-centric level of service. We view ourselves as your business partner and treat our engagements as an opportunity to continuously improve your business processes, rather than a mere exercise in compliance. (Phase 1): Each SOC 1 audit has a unique set of requirements. Every company’s scoping requirements vary depending on the type of services they perform for their customers. Our professionals have experience working in nearly every industry, and we work closely with our clients to ensure that their audit is scoped correctly and all regulatory and compliance requirements are met. During the scoping phase, we will evaluate management’s current report and objectives to ensure that it meets the requirements of SOC 1. This is completed by performing a detailed review of each section of their current report and then corroborating with management to ensure the scope and report content is current with SOC 1 standards. Any deficiencies are quickly identified and reported to management with recommendations for updating their current SOC 1 report. (Phase 2): A Readiness Assessment is designed to assess a company’s preparedness for a SOC 1 audit. By conducting a thorough gap analysis, our advisors will assess the current control environment by identifying strengths and providing recommendations for areas that need improvement, as well as review your current policies and procedures to ensure they cover the areas needed. As part of our detailed recommendations, we will provide a prioritized listing of controls that should be considered for implementation or enhancement prior to the audit (Roadmap to SOC 1 Compliance). A Readiness Assessment typically requires two weeks of combined on-site and remote fieldwork and is a valuable and effective assessment that will give you a good idea of where you currently are, and where you need to be. From the outcome of our Readiness Assessment we will issue a detailed listing of GAPs with supporting recommendations. Management will have the time needed to respond to and/or implement require remediation steps. Post-remediation supporting documentation can be submitted to our client portal for auditor validation to be performed remotely, without need for additional time on-site. Our goal is to provide sufficient preparation time, guidance and a remediation appropriate for the client. Upon completion of the remediation efforts and auditor validation, we start the clock for your period of review. Management also has the option for us to issue a SOC 1 Type 1 report at this time. This tool is utilized to assist organizations with reminders of when certain activities must occur. Throughout intervals during the next six to 12 months, we issue periodic audit requests to validate that control activities are being followed. Requests will be updated in our customer portal and validated by a senior auditor. Results of each periodic audit will be updated for management’s review. This is a series of interviews with management and process owners to re-confirm our understanding of the system and flow of transactions, identifying existing controls and assessing new controls implemented since the last on-site assessment. This process can last from one day to several weeks, depending on the size and number of client site locations. Through a combination of inquiry, observation and inspection procedures, the operating and design effectiveness of each control is assessed. Testing results are communicated to management. Management responds to identified deficiencies (if applicable). Your SOC 1 Type 2 will be a well-defined, highly-detailed, and quality report that meets compliance objectives for you and your customers. The quality of the report is of utmost importance to us. Prior to delivery, each report undergoes a thorough quality assurance review to ensure that it meets our internal quality standards and procedures. Only once the review is completed, the report will be issued. This is the opportunity for your audit to essentially pay for itself. A major benefit from completing the SOC 1 audit report is the tangible ROI that is created from having your company audited under the SOC 1 principles. How do we assist in this process? As part of our deliverables package, we will provide a customized draft press release, a high-resolution SOC 1 logo to place on your website and five professionally bound copies of your final report to share with your existing and/or prospective clients. (Phase 4): Upon completion of your SOC 1 Type 2 audit report, planning next year’s audit begins. This includes issuing audit recommendations, providing guidance and agreeing to terms for future engagements. Your Guide. 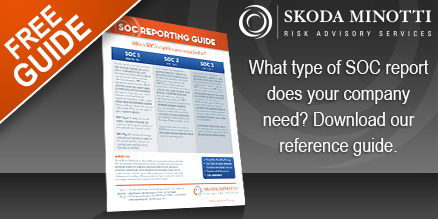 Which SOC report does your company need? Click below to get your free reference guide.